During the cold Winter, when the lack of sun can sometimes be draining, a killer ski trip can be an excellent way to recharge your batteries. Considering that most ski vacations can be costly and time consuming to plan (especially for ski groups), it only makes sense that you dedicate some time toward researching the right resorts for your needs. Here are some questions to ask before choosing a resort for your next vacation. Tip: You can always use our dedicated ski resorts page to do some of your own research. Does the Ski Resort Cater to Your Skill Level? Just as different skiers have different levels of ability, different ski resorts have different difficulties of slopes to tackle. The larger resorts will often have a range of slopes to suit all skill levels, but if you're considering a smaller resort be sure to check it has runs of suitable difficulty for everyone in your group. This is especially important if your group has children or beginners who may need some tame slopes to start out on. Trust me, nothing is worse than that one person stuck to the sofa all day, killing the vibes with "It's too hard," or, "I just can't do it, but you guys go ahead and have fun." Can the Size of the Ski Resort Accommodate Your Needs? From tiny Alpine villages to bustling mega-resorts -- ski destinations come in all sizes. And since the size of the resort is often proportionate with it's available lodging, size is an especially important consideration for larger ski groups and mountain weddings. Additionally, those looking for a vibrant apres-ski scene or busy nightlife might also consider larger resorts. However, if you're traveling solo, with your family and friends, or as a small company retreat, smaller may be better. Smaller ski resorts often offer more opportunities for mixing with the locals or achieving that quintessential mountain experience. Whichever your prefer, try and match the size and activities of the resort to the amount of relaxation or partying that you expect to enjoy. Just don't party too hard! Are There Enough Ski Runs to Keep You Entertained? Some resorts are based on a single ski lift with few runs, which can quickly become repetitive after a few days of skiing. Other resorts (such as last year's Canyons & Park City resort merge) may be part of a network where a single ski pass grants you access to a variety of slopes, offering plenty of opportunity for variation and experimentation with new terrain. Basically, it all comes down to your boredom threshold and length of stay. Always be sure that there'll be enough runs to keep you or your crew entertained. 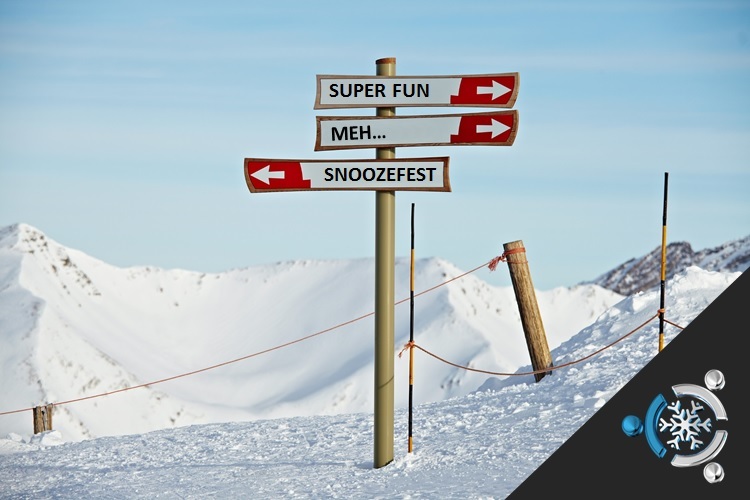 Is a Popular or Obscure Ski Resort Best for You? If your ski trip is purely about the sport, then one of the more well-known major ski resorts may be a prudent choice, as they have the best facilities and the widest range of slopes to ski on. However, these popular destinations can sometimes lack a little character, local charm and shorter lines. If you want to have a deeper experience of the area or country you're visiting, then a smaller resort somewhere off the beaten path might be best, even if it means the skiing facilities themselves aren't as advanced. Of course, the ideal situation would be to stay in a small town that has easy access to a larger resort, so that you get the best of both worlds. Visiting new and unknown ski resorts will always involve an element of chance. You can always reduce the likelihood of a bad trip by asking yourself these simple questions above and working with an experienced tour operator or travel agency. Get Insider Deals on Ski Resorts, Gear & More!